Tomorrow afternoon, I will be heading to Washington DC to take part in the inauguration of President Barack Obama! While in DC, I will also participate in a day of national service in honor of Martin Luther King and the service movement, on MLK. I encourage you to find ways you can take some time to serve in your community on Monday and be part of this exciting day of service. Make it a day on, not a day off! While at the inauguration, I will be taking notes and pictures for an essay I intend to write in reflection of the events when I return. I will post this alongside the essay I wrote in 2005, the year I went to Washington to protest President Bush's inauguration. I will really be coming full circle with this trip, and I couldn't be happier or more excited. Many have criticized Israel's recent actions in Gaza, yet few understand the context of the military action. Here, in clear and verifiable print, are some of the key numbers from this conflict. 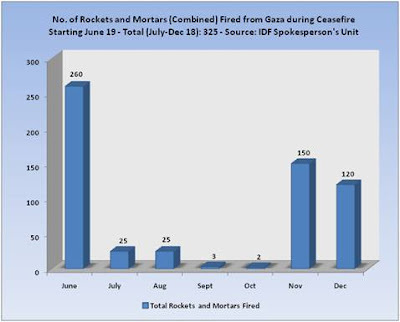 They help to put into context the unrelenting rocket attacks directed deliberately at Israeli citizens even during the recent "cease fire," and underscore the efforts Israel has taken in good faith to give Gazans land for peace. 179 truckloads of humanitarian aid that have been delivered through Israeli crossings into Gaza since the beginning of Operation Cast Lead, including basic food commodities, medication, medical supplies, donations of governments and blood units.